The $11.3 million upgrade will allow around 850 million litres of stormwater a year to be captured and cleaned. The project will deliver the City's largest water harvesting system, and help the City of Sydney achieve our 2030 target for 10% of water demand to be met through local water capture and reuse. 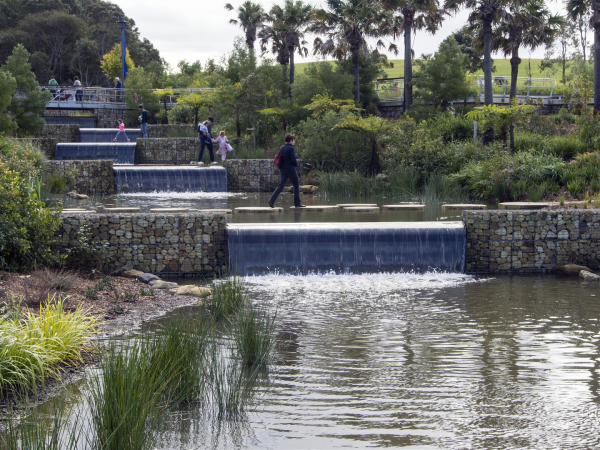 This project was funded by the City of Sydney and built in partnership with the Australian Government through the National Urban Water and Desalination Plan. 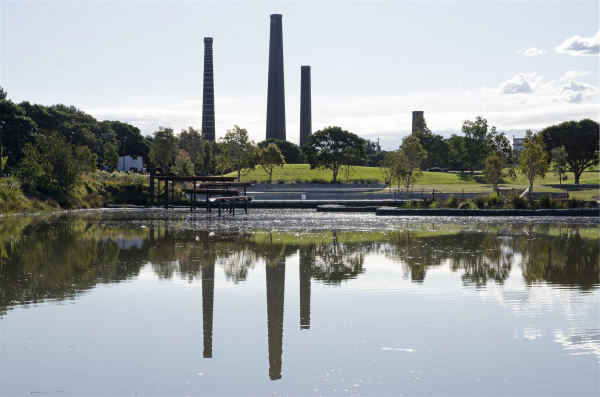 At the heart of this project were the processes that enable urban waste water to be harvested and made good for reuse within and beyond Sydney Park. Making these water flows and reuse processes visible was an important part of the project, as they highlight the intrinsic relationship between water and urban life, topography, people, plant life and fauna. 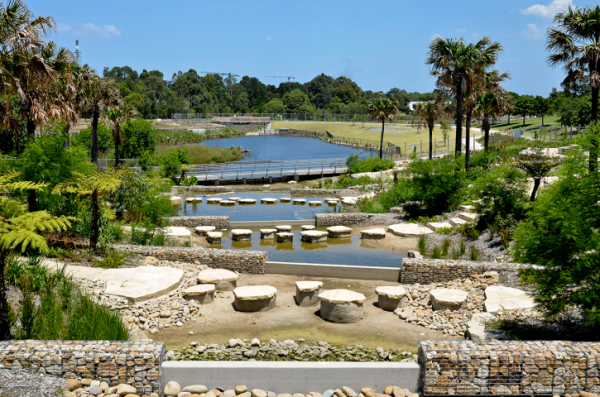 Sydney Park Water Re-Use Project is one of the city’s largest environmental projects to date, forming an integral part of the strategy behind Sustainable Sydney 2030. 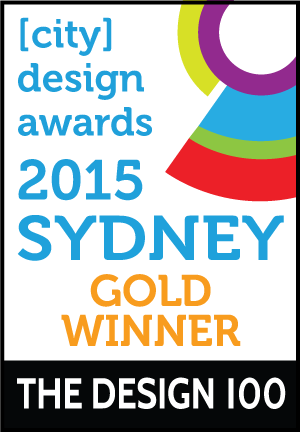 The project is a seamless intersection of design, art and science; an outcome only achieved by the devoted collaboration between those involved. Turf Design and Environmental Partnership (TDEP) facilitated the round table of creatives, harnessing the skills of Alluvium (water & environment), Dragonfly (ecology) and Turpin + Crawford Studio (public art). 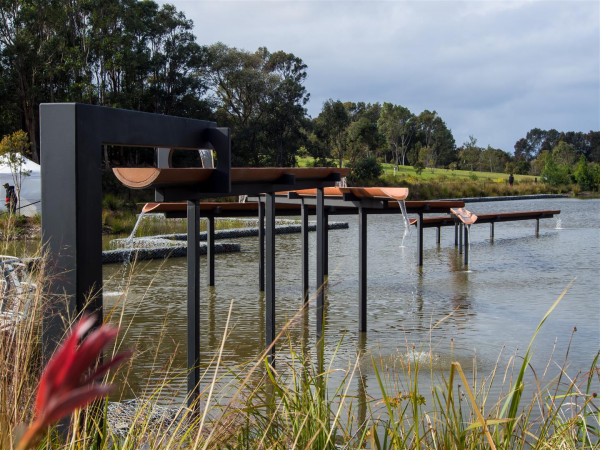 The beating heart of this project tells a story about water; through its function and processes that enables water to be harvested in its wetlands, made good and returned to viable use within the park and nearby industry. 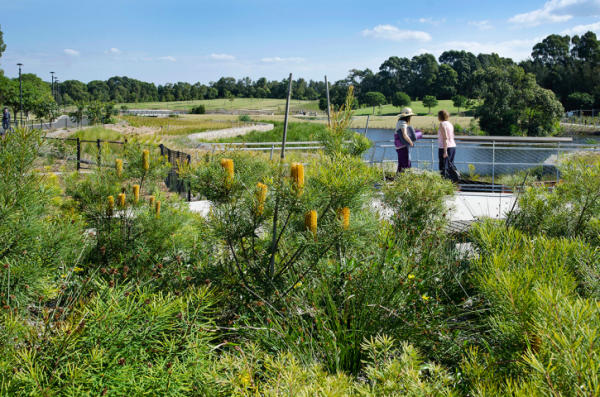 ‘The Cascades’ bio-retention wetlands captures water from the Newtown catchment; the equivalent measure of 340 Olympic-sized swimming pools worth per annum. 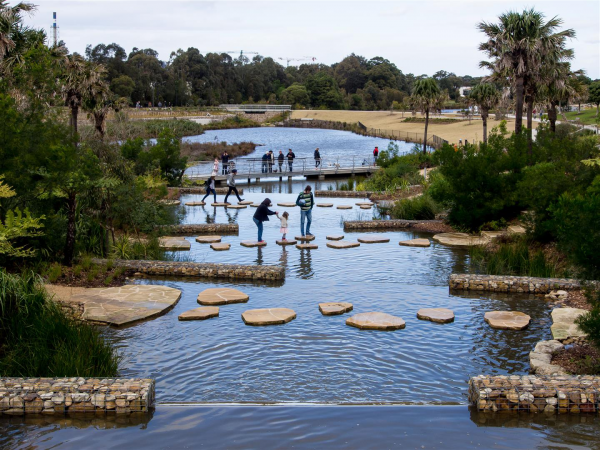 The project reinvigorates our view of the park’s landscapes, by creating intrigue and dialogue as park users explore and discover ‘moments’ in the landscape that can be at times playful, dramatic and peaceful, but at all times connected to the water narrative of capture, movement, and cleansing. Turpin + Crawford’s ‘Waterfalls’ artwork playfully releases water from the wetlands and into the ponds; playing on the spirit of water and its interactions with topography, form, surfaces, plant life and fauna. New picnic grounds, paths and recreational spaces are interwoven through the new park landscape; enhancing amenity and accessibility for all park users. The exposure of this project not only offers inner city residents and the wider community a new place to relax, play and gather in, but it educates on the importance of water management and how improving water quality and reducing potable water use can be intrinsically linked to the urban parkland ecology. 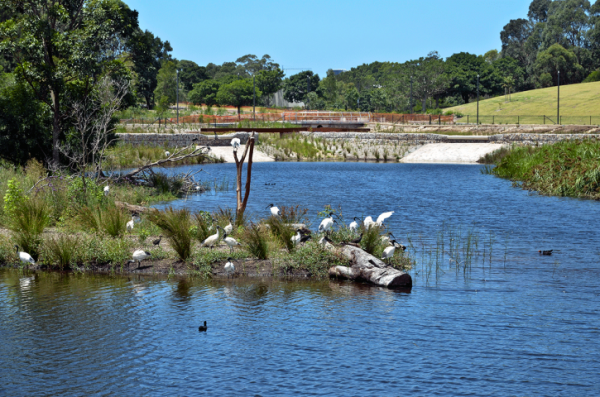 The $11.3 million storm water harvesting system will capture and clean enough water to fill an Olympic-sized swimming pool every day, providing a sustainable supply for the park and its wetlands and returning any remaining water to Alexandria Canal.The water recycling system will sustain the lawns and wetlands for generations of Sydneysiders to enjoy. 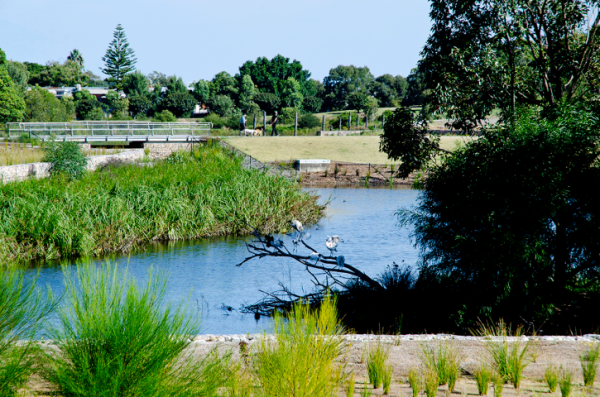 With cascades and bush areas, the wetlands are already attracting new wildlife to the park, which has the highest population of native bird species in the local area, including 22 wetland species.